On Tuesday I met my SIL and BIL and head to airport ti fetch my in laws they will be back from China today. Due to delay in flight we didn't bring TT along cos she need to wake up for school early. Flight delay till around 12am .... tiring but glad to see they have fun there. And on Thursday I went to up "curtains" - LASHES! I agree with Fiona feeling weird w/o them on .... as for me I am lazy and not good in doing it everyday, I do an extension again thanks to Pauline for the recommendation - Liping indeed is good in doing it! Love it to the max! Dated my parents out for dim sum unfortunately Dearie dun have the luck he is going back to work! So we took a cab to Chinatown and really no luck Yum Cha is closed for renovation so we went over to Da Dong instead. Dun really like the place Waitress there not very friendly and attentive I will not go back there again. As for food really lose to Yum Cha ..... not very satisfied with it! Papa say wanna bring Mama go shopping so they went off after the meal. As for me and TT we went over to Chinatown Point to shop and bought a few pieces of Doraemon items there. Lucky we manage to catch a cab and head to PP is was pouring heavily. We shop around at PP and meet up my SIL, BIL and family for dinner at Bedok Point for dinner, my Parent In Law went China yesterday so we are all by ourselves for dinner! After the dinner I "sneaked" back home left TT with my SIL cos she will be taking care of TT when my PIL are away. Thanks Sis! Nothing to update on my Thursday and Friday i just feel unwell on Thursday ... head is getting heavy during the noon time ... thanks Dearie for looking after my little Princess and forbid her to disturb me when I am resting. On Saturday TT have lotsa fun in her Tumbletots and Berries ..... and of cos after Berries we brought her to Marina Barrage for kit flying ... this is her first time! Thanks to Grace for the lovely kiddo golf set she really love it! Hmmmm this is my dunno how many times in kite flying. I still remember going out with my secondary friends to Marina South for the kite flying those were the good old days! 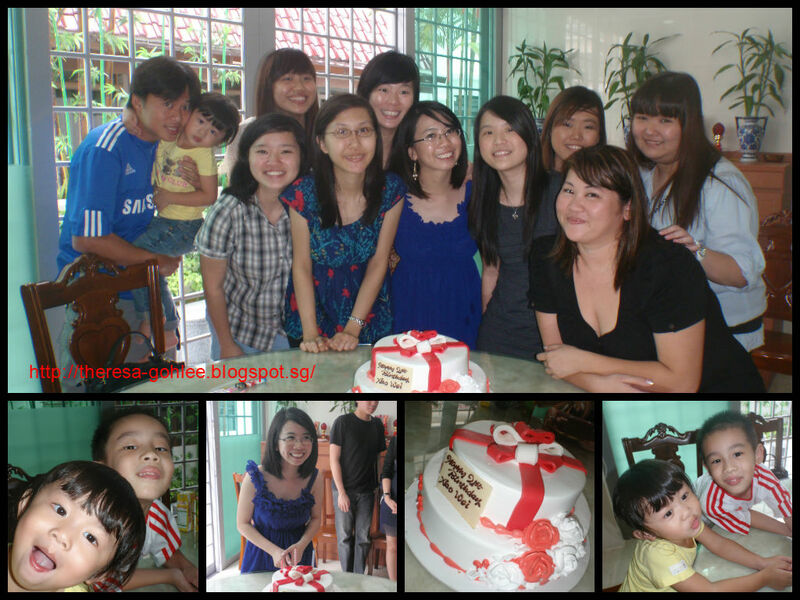 Really have a great fun with u gals looking forward for more and next time round I want Doraemon Kite! Met up with my dear cousins for dinner tonight .... Suppose to meet at 730pm but I am first to reach ..... and I am there at 5.50pm! I just took 20mins to reach there really heart circle line! Thumbs up! We headed to MOF for dinner ... and I guess we are the most noisiest table of all .... is so fun having a dinner with them! We have so much to share! So when are we going to have it again? Whenever I have time I will snap pics for my dottie hahah lately my in laws maid love tying up her hair .... her hair grow really slow .. imagine she is 3 years old but her hair is still consider short comparing with some of my friend's dottie ..... for example like Ivy's dottie - Faith! I love to tie her hair but my nottie baby just dun wanna sit still for me to tie I wonder how the miad do it ... cos she tie plaid for her! And whenever she about to sleep I wil take it off and it turn out to be frizzy curly hair hahaha really nice! 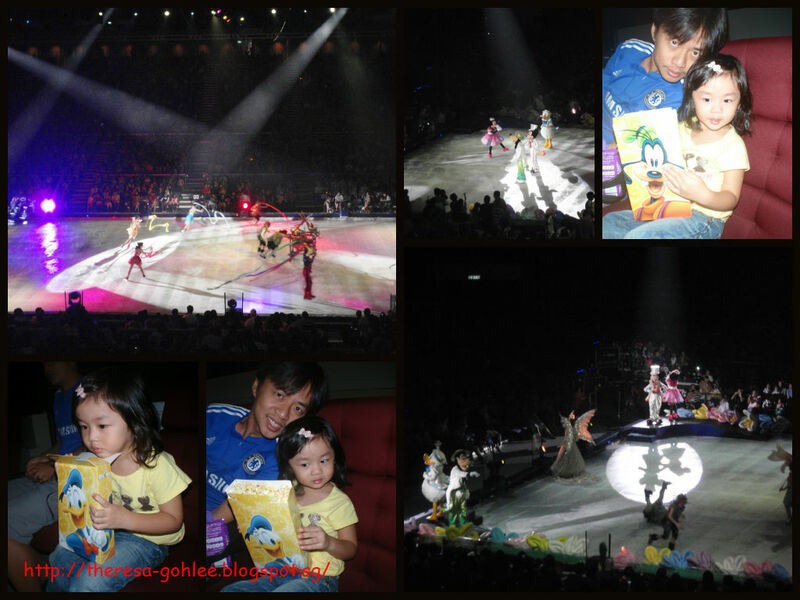 Woke up early to go catch the morning show for Disney On Ice ..... surprisingly there is a large crowd! Disney merchandise is not cheap too but still I get it for my dottie cos she love Disney! After the show we headed to Leisure Park for window shopping and went over to Xiaowei's house for her 21st birthday celebration. Xiaowei is Dearie's ex student when he is teaching in Bedok View and this group of girls have been keeping in touch with us. Xiaowei's house is really big and she bring us for a tour in her house ... can u imagine TOUR! Total 4 storey of her place and each level have 3 room with 2 toilet and a mini living room and every floor with TV! I can't imagine I stay in this house I will die cos need to climb the stairs and on the top floor is a mini stadium - table tennis, pool table and badminton on that floor! We all have a good time at her place thanks for the invites gal! In the evening we went over to Long Beach at Kallang for dinner to celebrate my BIL's birthday there is so many March babies I know .... I love March! Food is good and I love the service there too! Thumbs up! Lately my President very active coming into our office ... worse is he always like to come in at around 12+pm and 1pm is our lunch time so we can't eat in so we went out for lunch. 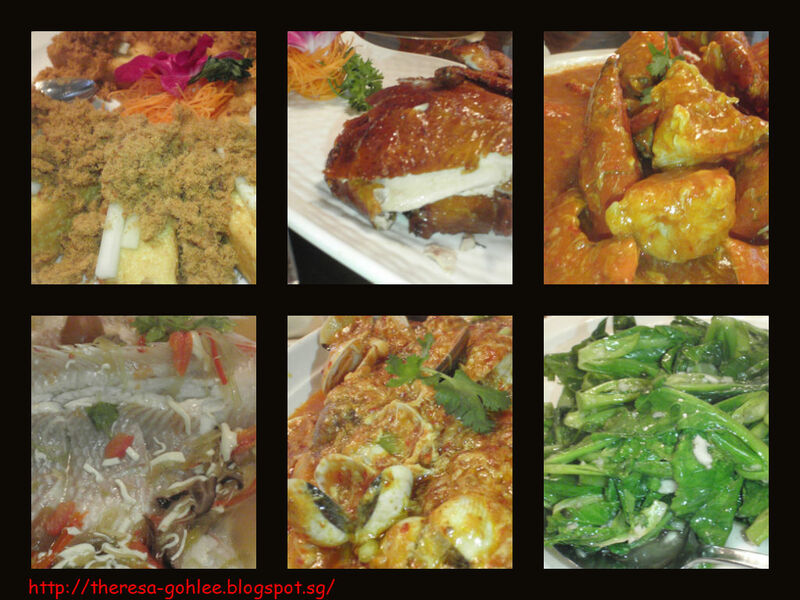 Today we went over to the corner restuarant to have lunch and we ordered 5 dishes - Marmite chicken, sweet and sour fish, Cereal Toufu, spring Onion Pork and Sambal Kang Kong. Marmite Chicken and Cereal Toufu is the best and all these cost only $50+ dirt cheap and we are all very full after the hearty lunch we had. Is really all about food for this week usually we will skip tea break this week we are filled with nice kuay and bao from some coaches. 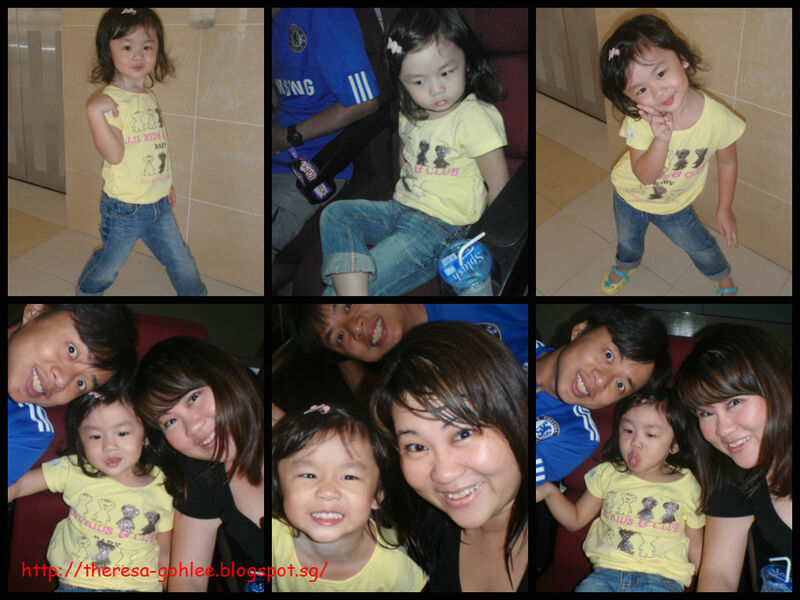 On Friday I helped my in laws, Uncle and Auntie to book air tickets to China Thanks to Ivy for the good deal love ya! Nothing much to update... went back to MIL place for dinner ... very routine ..... just that Dearie went out at around 11+pm to CCK cemetery with my in laws and relatives cos they are going to dig out the bones of his Grandpa and Uncle (he is also my hubby's Godpa). Lately at office lotsa Instructors bought us food ... chocolate, tidbits and seaweed yummy think will really make us fat! 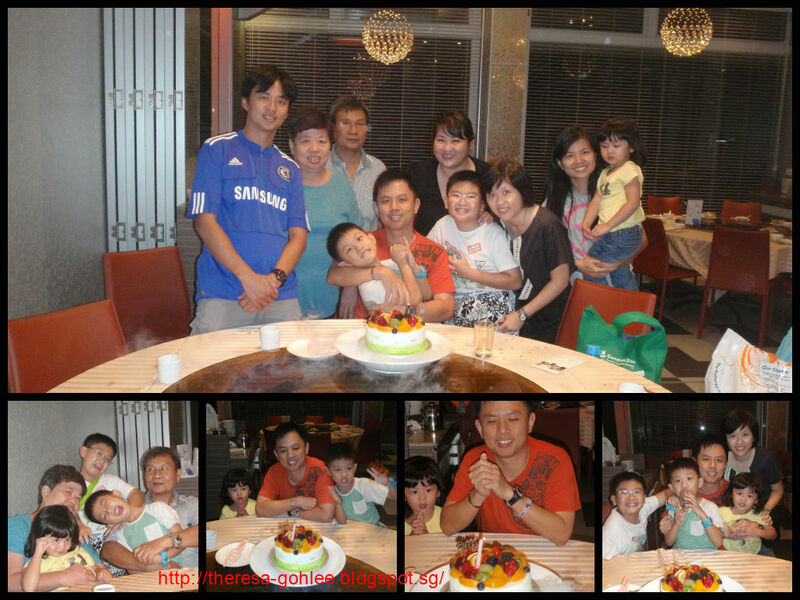 On Wednesday we all took leave cos we are going to have Grandpa and Uncle (Godpa)'s ashes place together with Ah Ma's. After the praying we are quite tired ... FIL say that he dun wanna open his shop so rested at home. As for us we left at around 4+pm and headed to Ikea. When we reached there we notice that kids dine free on their weekdays from 6-10pm so TT have their kids meal nugget and fries as for Dearie he opt for cajun chicken and I order the curry chicken. Curry chicken is really very nice! Love it! Try it if you are at Ikea :). Nothing much to update on my Thursday and Friday ..... hmmm maybe just only recent new toy that we bought a lap top and Ipad ... Ipad is an investment for my TT ... I can let her play and learn at the same time. Everytime I feel so pai seh that my friends have to let TT play their phone and my dear dottie so smart to play some application that I dunno how to play haha hope is a good investment! Now am thinking to change to iphone anot since my Nokia giving me some problem! Woke up at 6am to prepare to go Bintan .... so excited cos is my very first time going there expected it to be about the same just like Batam. Thanks to Weeli for doing most of the coordination for us! Thanks to Joey's Dad whom came to pick us to the Ferry Terminal early in the morning. Joey even make breakfast for us! As for TT she is still in her sleepy mode when we brought her down. Tanah Merah Ferry Terminal is just as busy as at Harbourfront. Q started to get long at around 8+am as for the kiasu us of cos were all in Q ..... glad that we manage to get a good seat. Reached Bintan at around 10+am and we are able to have an early check in to our villa. Headed over to their town after we settle our stuffs in our villa we called their so call private taxi and it cost $5 per head. He brought us for lunch and beside the restaurant is just the massage parlour. We ordered about 5 dishes and comes with free soft drinks total cost for the meal is just $38+ dirt cheap! After the meal we went to Pasar Oleh Oleh to shop and bought some gifts back. After the walk we went back for massage Dearie and I went for full body massage while Joey and Weeli went for their foot reflexology thanks them for looking after TT while we can enjoy our full body massage. Weeli and Joey suggested to go for kelong seafood dinner ..... nice place just that lights are too dim we have really heavy meal ..... went back to our villa to rest and chit chat till 12+ then we knock out. Nothing much to update on Wed and Thurs.... but on Friday I took a half day leave to pack some stuffs at home and my dear Lanetar came office to look for us for lunch. We went With a Pinch of Salt for lunch ..... food standard still there but their set meal change into very different kind of style. $6.80 set meal and $9+ set meal is about the same nothing much to talk about. Thanks gal for the lunch treat! I am looking much forward to the evening dinner with my multiply girlfriends........ was pretty early for the dinner so I went to shop around and went over to Paragon to meet Hazel. The gals so sweet to buy the March babies a gift each.... thanks my dear friends love all of you! Thanks to Hazel for your cake and gift too ... love it very much!